Starbucks sales are up. Peet’s is buying up competitors. Can coffee tell us anything about the economy? Can You Still Trust the Starbucks Index? Weak coffee sales supposedly predicted the Great Recession. What are today’s weird java trends telling us? In the midst of the Great Recession, customers were economizing on Starbucks, but not on more expensive brews. The market for lattes and espressos is boiling hot. Sales at Starbucks are up 8 percent over this time last year. Peet’s Coffee & Tea reports sales of the company’s iced coffee offerings have increased by more than 70 percent since the company debuted a new cold brew offering earlier this year. According to market researcher First Research, revenues at coffee shops in the United States increased from $10 billion in 2011 to a projected $12 billion in 2015, an increase of 20 percent in four years. The market for hyper-upscale coffee has grown by 20 percent annually, according to retail data analyst IBISWorld, keeping up with the stock market and the real estate–fueled income growth of the 1 percent, and then some. The up-market coffee shop biz is so steaming that there’s even now a popup coffee shop exclusively serving decaf located in New York City’s Lower East Side. Decaf! All this was surely a factor in Peet’s seemingly caffeine-fueled shopping spree last month: The company bought upscale competitor Stumptown Coffee and took a majority position in Intelligentsia Coffee in the space of about three weeks. All of this raises a question: Is coffee becoming yet another marker of our age of inequality? 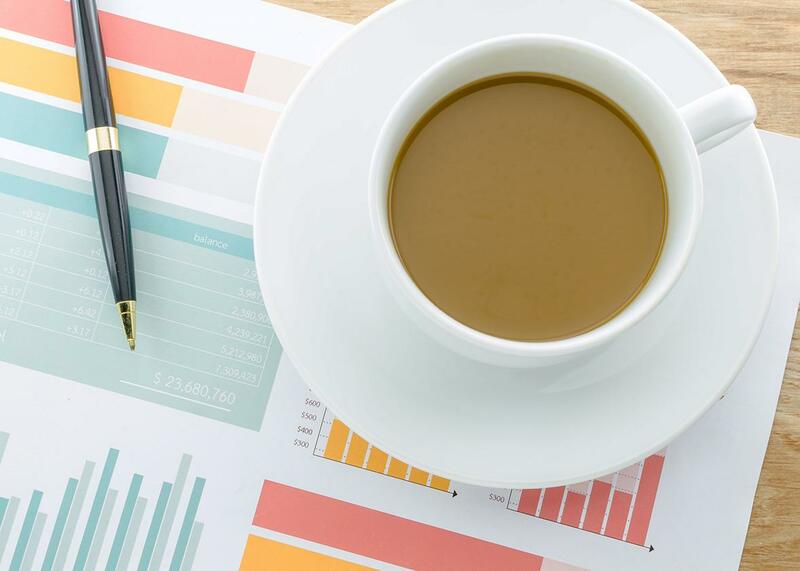 Perhaps it’s time to update the coffee bar index—also variously known as the Starbucks recession indicator, the latte index, and the Starbucks economic indicator—to see what’s going on. No doubt you’ve heard of the hemline index, with which prognosticators attempt to discern where the economy is going based on fashion industry dictates on the length of skirts. There’s also an underwear index (sales fall during recessions!). We New Yorkers have our own financial indexes. New York magazine once promoted something called the hot waitress index, which I will not deign to describe, and I’ve been known to mutter about what could be called the Saks index, which involves determining how eager high-end retailers are to offer their service to consumers who aren’t related to Russian oligarchs or Wall Street titans. These indexes make for fun parlor games, if you can forget that people’s pocketbooks are at issue. But by late 2007 and early 2008, it was becoming clear to many people that something wasn’t quite right with the economy. Housing prices and sales were falling. So was the stock market. In March 2008, investment bank Bear Stearns collapsed. But the Bush administration continued to insist nothing serious was amiss. Enter the coffee bar index. A few of those who disagreed with the prevailing consensus began to note sales and traffic at the home of the Frappuccino were falling. Heck, even Starbucks executives claimed the faltering economy was behind their lagging sales. Yes, even in the midst of the Great Recession, customers were economizing on Starbucks, but not on more expensive brews. Something had changed. American coffee aficionados divide the modern age of java into three distinct periods. The first begins in the late 19th and early 20th centuries, the age of mass consumption. That’s instant coffee, stuff you could buy at the A&P, like Folgers and Maxwell House. It was cheap. It was easy. Taste was not, shall we say, a primary consideration. The second age begins on the West Coast in the late 1960s and early 1970s, with the founding of chains such as Peet’s and Starbucks. They sought to upgrade the product, but even more than that they wanted to popularize a perceived European way of drinking coffee—hanging around coffee houses with friends, drinking quality brew. It was more expensive than what was offered up at the local Greek diner, but it wasn’t out of reach. Coffee bars were viewed as cheaper than bars that served the stuff more traditionally found in bars, a factor that no doubt accounted for the fact that the trend really began to take off in the early 1990s, as Seattle’s grunge sound went national and Generation X was battered by the recession of the early part of the decade. Their growth was widely viewed as a recessionary sign. The Baltimore Sun quoted one 24-year-old in 1994 saying, “We’re more spoiled, but because of our lower income overall, we have to settle for lesser pleasures, like a good cup of coffee.” Coffee-shop owners agreed. “People are watching their money in the ’90s, so coffee shops are becoming meeting places,” the manager of Uptown Bakers in the Washington, D.C., area said in the same article. Some predicted the trend would slow as the economy improved—the Seattle Times actually noted the closing of a drive-through espresso stand in late 1993 with the headline “Has Seattle Coffee Craze Perked Out?” But we all know happened next. Starbucks saw a growth spurt, and by the end of the decade, personal-finance gurus were blaming the United States’ lackluster savings rate not on wage stagnation and the increasing cost of health care, housing, and education but on people who spent too much money sipping lattes and scarfing muffins at their local coffee holes. But at the same time in the damned-if-you-do-damned-if-you-don’t world of American consumer culture, coffee shops, and especially Starbucks, became a sign a neighborhood had arrived, similar to the function Whole Foods plays today. “Harlem’s 125th Street Turns the Corner Development Surge Spurs Neighborhood,” proclaimed the New York Daily News in 1999, when one opened in the historic black enclave. “The shop was a symbol of the neighborhood’s new economic era,” wrote William Frank Mitchell, then an instructor of urban and community studies at the University of Connecticut–West Hartford in African American Food Culture. But now there are more than 20,000 Starbucks worldwide. When anyone can buy a bit of luxury status, the item in question soon ceases to offer much in the way of status at all. Which brings us to the third wave of coffee, the world of Stumptown and Intelligentsia, the coffee house equivalent of artisanal, farm-to-table food. At Intelligentsia, ordering coffee is something of an art form, with specially trained baristas sometimes taking more than 10 minutes to prepare each made-to-order latte, espresso, or lightly roasted coffee. As the website reports, “We take 24-hour redeye flights and 10-hour, high-altitude pick-up rides over serpentine roads. You pick up our coffee and we shake the hand of a farmer in Peru. Or Rwanda. Or Guatemala.” And each and every Intelligentsia outlet is individually designed by well-regarded architects to reflect the individual ethos of such chic neighborhoods as Venice Beach, California, and New York’s Chelsea. All of this leads to higher prices. The Chicago Tribune reported earlier this year that Starbucks charged $2.75 for its basic cold latte and $3.25 for its cold brew, while the local Intelligentsia got away with $3.75. Others manage to persuade their customers to part with even more cold hard cash. Last year, the New York Daily News caught Greenpoint’s Budin charging $7 for a licorice-infused latte. The popular coffee shop was far from humiliated. The following month, the New York Post discovered it charging $10 for a similar-sounding cuppa joe, a price at which it has remained. When I checked in with Budin this week, co-owner Crystal Pei assured me most of her customers were ordering the more budget-conscious $5 Aeropress single brew. But that might just mean they wanted a cup of coffee, not a specialty product, she was quick to add. As for Starbucks, the stock market wasn’t happy with its most recent earnings report. Sales in the United States were strong, but the Asian market was tepid, likely thanks to China’s economic problems. The stock fell. Is all this a sign that the market for coffee is getting a bit frothy? Or were investors overreacting? And what can all of this tell us about our broader times? Well, that’s the thing about indicators. You can pick what goes into them and ignore what doesn’t fit the thesis. It’s sort of like reading tea leaves—and deciding which leaf to read. Yes, the coffee bar index called the recession—but it didn’t predict what would come next. Almost everyone forgot to include artisanal beans in their reviews. In other words, it was a small snapshot in time, reflecting conditions at the moment, not how they would be in the future. So for now, drink up.